Today is Tax Day, and a new study found it's the top day of the year for ROBOCALLS. Scammers like today because everyone's on edge and not sure they did their taxes perfectly, so we're a little more susceptible to someone posing as the IRS asking for money or personal info. Remember, the IRS will never call you and demand immediate payments: especially in the form of gift cards and wire transfers. If you think you may owe but are unsure of the call, call the IRS at 800-829-1040. Getting an Extension -- If you need more time, you can file for a six-month extension to avoid paying penalties for getting your return in late. However, if you owe money, it needs to be paid on time, even if you get an extension to file your return, or you'll have to pay a penalty and interest. Paper Returns Postmarked By Midnight -- Most taxpayers file online now, but if you're still using paper returns, they need to be postmarked by midnight. Meanwhile, some places are offering discounts in honor of the day. Hardee’s: Enjoy free sausage biscuits from 7 to 10 a.m. TODAY at participating locations. To get this freebie, you need to say, “Made from scratch.” One per customer, while supplies last. Tax not included. Hooters: Kids eat free through Monday with a $15 adult purchase at participating locations. Participating locations here: http://bit.ly/TaxDay19. Office Depot/OfficeMax:Through April 27, get up to five pounds of documents shredded for free with this coupon posted at www.officedepot.com. BurgerFi: Get a $4.15 BurgerFi Cheeseburgers on Monday through the BurgerFi app only. Download the app at www.burgerfi.com/rewards. 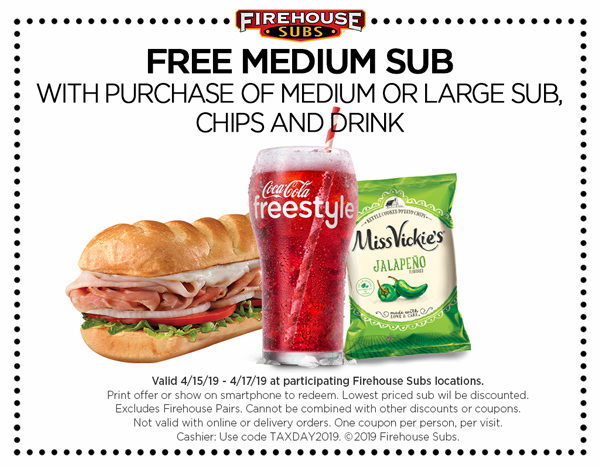 Firehouse Subs: Get a free medium sub with purchase of a full-price medium or large sub, chips and a drink Monday through Wednesday at participating locations.You'll need this coupon. McDonald’s: Participating restaurants in select locations across the country have Tax Day deals Monday. Check with your closest location. There also are various offers on McDonald's mobile app including buy one Big Mac, get one for 50 cents.